The rise and rise of Spanish super Stopper David de Gea. Just as the ink was drying on the five year contract agreement signed by 20 year old Spanish goalkeeping sensation David de Gea, a sense of optimism was ushering through many a Manchester United supporters worldwide, for arguably the most promising young goalkeeper in the world had signed for the club in a rather prolonged transfer move worth some 18-20 million pounds, depending on the sources that you might look to believe. And while some would still argue that the transfer fee paid for his services to Atletico Madrid is pretty steep for a 20 year old with very limited experience of playing in a European top league, what needs a bigger mention here is the fact that United have extensively scouted him during his matches over the last year and a half, almost as if he had already been hand picked to be the heir to the legendary Dutchman Edwin van der Sar and it was going to be a matter of when rathern if Sir Alex was going to get him, with the first contact that United made for him dating to as far back as January 2010. And while Sir Alex has made the odd error in buying young players with potential, more often than not he does get it right often unearthing previously unknown gems(Chicharito being a glittering example of a previously unheard name, now having a worldwide fan following), and to bank against the great man’s judgement is a risk you take at your own peril(cue-Alan Hansen). That aside, the signing that has gone through is of an undeniably prodigous young goalkeeper, often touted as the heir to Iker Casillas’s Spanish no. 1 shirt. The rise for de Gea has been meteoric, from the youth ranks of Madrid’s second club to one of the most followed clubs in the world. 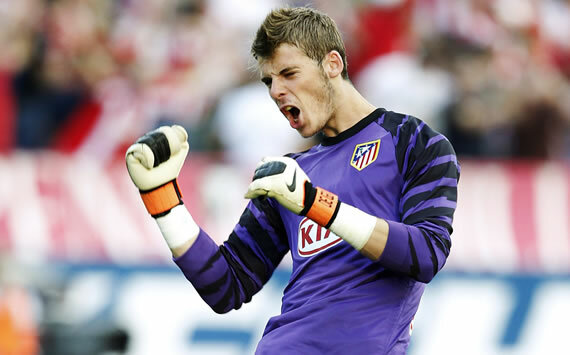 Little less than two years ago, a then 18 year old de Gea was still plying his trade for the Atletico B-team in the Segunda division and effectively was third choice for the club behind Sergio Asenjo and Roberto. 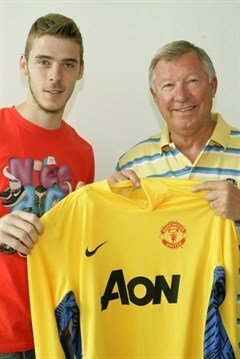 But destiny had something else in store for him, an international callup for one and an injury for the other meant, de Gea was coerced to start against Porto, making his Champions League debut aged just 18. League debut followed days later and both times de Gea had done exceeding well, promulgating the break through of a true goalkeeping sensation. And even though Asenjo, himself just 20, kept his first choice status for a while, a spate of indiscretions in goal meant he was axed and de Gea, a true Atletico boy, was going to be first choice at a club he had loved all his life. de Gea had realised a lifelong dream of playing for the club he had always adored, and on the pitch he was serving one stunning performance after the other, winning man of the match awards along the way too. But the crowing glory for him in the season was when he helped Atletico conquer the inaugaral Europa League in Hamburg, giving another sparkling display in the final and winning his first(and hopefully not the last) European trophy at just 19 years of age. And, if his debut season was great, the next one was even better, bordering the stupendous. He made a string of top drawer saves and even saved a penalty as Atletico wrecked Inter 2-0 in the Super Cup in August. Frankly, if the last season was the breakthrough, this was about the arrival of a young goalkeeper extraordinaire. A string of quality performances had Sir Alex already glued to him with United scouts, Martin Ferguson in particular, making frequent trips to Madrid to watch him play. And even though the season was rather bland overall for Atletico, de Gea had caught the eye of one wily Scot. Well before the season had ended speculation had been rife that de Gea was going to be on the move. And even the U21 Euro Championship,which de Gea won, only served as a delay and not a deterrent to de Gea’s eventual Old Trafford move. If anything the season ending U21 championship, further solidified the reasons why United had to move for him and quickly as de Gea continually shone in Spain’s matches culminating in Spain lifting the trophy and him being named in the tournament’s All-Star squad. What United have at their hands is a young and promising gem, who has his strengths and like any other player, his share of deficiencies too, but like gentle clay, he’s young enough to be moulded over the way the team wants him to be, and for that there is no better man than the wily old gaffer Sir Alex who has turned numerous young artful boys into men who have gone on to dominate English football and even European sporting warfare. The potential in the boy seems rather endless and the fans can hope to see him rise to the very top and in the process avoid the second-coming of a post-Schmeichel era that was eventually baulked only by arrival of van der Sar’s calm demeanor that settled United’s defence down. And to replace the great Edwin van der Sar himself could well seem a herculean task for the young lad, but then there is nothing that cant be done especially by a boy who has already taken massive strides of maturity at such a young age. Effectively, what the young lad would need besides his natural talent at United, a club much larger than Atletico Madrid(with due respect), is patience and character to grow and to learn new tricks of the trade, and just as they say one of the biggest weapons for a goalkeeper is his experience, de Gea would have to grow likewise to engrave his name in the United folklore and to ensure that United dont go into another post-Schmeichel era where the United defence was frequently punctured to a leaky cauldron by keepers such as dope-downing Mark Bosnich, calamity Massimo Taibi, dolt Roy Carroll and clumsy oaf Fabian Barthez . That said, given the attitude, the talent and supertemporal potential that the young stopper posseses and has displayed thus far, forcing many already to herald him as the next goalkeeper extraordinaire and future Spanish no. 1, there is no reason to believe that he can not cope with the rigours of playing for a club like United especially under the able guidance of the man at the helm. And while only time will tell how David de Gea’s English adventure goes, what most United fans would hope to see a decade on from now would be to see the name of this Spanish super Stopper in a bracket perhaps close to the Great Dane Peter Schmeichel and the Dutch Colossus Edwin van der Sar, and dream to see the continuity in the rise and rise of this dimunitve Spanish goalkeeper. Well, dream it sure is for United fans to see him become one of the best, but then the theatre of dreams has seen it all before and here’s hoping that de Gea is next in line the list of Sir Alex’s fabled youth prodigies turned to world-class players. Welcome to the Theatre of Dreams, David!